Having already caught the ears of SZA, Noname, D'Angelo collaborator Isaiah Sharkey and more with her six-stringing skill, Nashville guitarist Melanie Faye can now include Mac DeMarco among her fans and collaborators with the arrival of a new track. The two have come together for a smooth instrumental titled "Eternally 12," which arrives alongside a video. 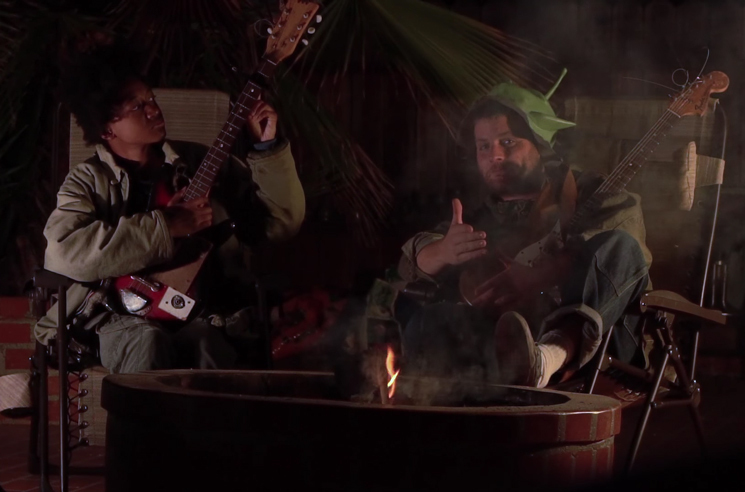 The clip finds DeMarco and Faye seated by a fire with their instruments, sporting alien and Dragon Ball Z masks. Faye is currently working on an EP titled HomoPhone, while DeMarco recently delivered Old Dog Demos for Record Store Day. Mac DeMarco Shares New Song "All of Our Yesterdays"
Hear Mac DeMarco Join Melanie Faye on "Eternally 12"